18 And the one of them, whose name was Cleopas, answering said unto him, Art thou only a stranger in Jerusalem, and hast not known the things which are come to pass there in these days? 19 And he said unto them, What things? And they said unto him, Concerning Jesus of Nazareth, which was a prophet mighty in deed and word before God and all the people: 20 And how the chief priests and our rulers delivered him to be condemned to death, and have crucified him. 21 But we trusted that it had been he which should have redeemed Israel: and beside all this, to day is the third day since these things were done. WITH A HEADLINE LIKE THIS WE KNOW WHY THE NUKES ARE READY TO START FLYING.MUSLIM/ARABS TRYING TO STEAL JERUSALEM FROM ISRAEL.THATS WHY JESUS WAS RESURRECTED ON THIS EASTER TO DEFEND JERUSALEM AND ISRAEL AND TO GIVE THEM THEIR PROMISED LAND.NOT THE ARAB/MUSLIMS STEALING GODS AND ISRAELS LAND. Jordan, PA sign agreement confirming their "common goal to defending" Jerusalem and their opposition to so-called "Judaization" of city. 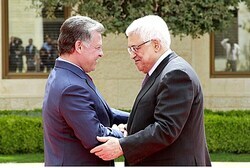 Jordan's King Abdullah II and Palestinian Authority Chairman Mahmud Abbas signed an agreement on Sunday confirming their "common goal to defending" Jerusalem and their opposition to efforts to “Judaize” the eternal capital of Israel.Palestinian Authority Religious Affairs Minister Mahmoud al-Habash said the agreement confirmed Jordan’s role as protector of the city’s holy sites and “Palestinian sovereignty over all of Palestine, including its capital East Jerusalem,” the Ma’an news agency reported.A statement by the palace said the deal confirms Jordan's historic role as custodian of Muslim holy sites in Jerusalem, particularly the Temple Mount, and outlines coordination between the two sides. "In this historic agreement, Abbas reiterated that the king is the custodian of holy sites in Jerusalem and that he has the right to exert all legal efforts to preserve them, especially Al-Aqsa mosque," the statement said, according to AFP. "It is also emphasizing the historical principles agreed by Jordan and Palestine to exert joint efforts to protect the city and holy sites from Israeli judaization attempts. ""It also reaffirms the historic principles upon which Jordan and Palestine are in agreement as regards Jerusalem and their common goal of defending Jerusalem together, especially at such critical time, when the city is facing dramatic challenges and daily illegal changes to its authenticity and original identity," it said. "Jerusalem is currently facing major challenges and attempts to change its Arab, Muslim and Christian identity," the palace claimed, as the Arab world further attempts to strip Jerusalem of its Jewish identity. JERUSALEM (AP) — Catholics and Protestants flocked to churches to celebrate Easter on Sunday in the Holy Land and across the broader Middle East, praying, singing and rejoicing as a new pope pleaded for peace in the region.Some Mideast Christian communities are in flux, while others feel isolated from their Muslim-majority societies. In places like Iraq, they have sometimes been the victims of bloody sectarian attacks.At St. Joseph Chaldean Church in Baghdad, some 200 worshippers attended an Easter mass that the Rev. Saad Sirop led behind concrete blast walls and a tight security cordon. Churches have been under tighter security since a 2010 attack killed dozens. "We pray for love and peace to spread through the world," said worshipper Fatin Yousef, 49, who arrived immaculately dressed for the holiday. 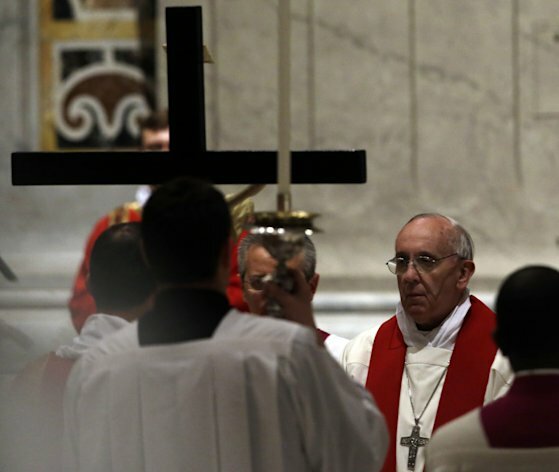 She wore a black skirt, low-heeled pumps and a striped shirt and her hair tumbled in salon-created curls.It was the first Easter since the election of Pope Francis and she and others expressed hope in their new spiritual leader. "We hope Pope Francis will help make it better for Christians in Iraq," she said.The pope spoke of the Middle East in his first Easter message, pleading for Israelis and Palestinians to resume negotiations to "end a conflict that has lasted all too long. "He also called for peace in Iraq and in Syria. "How much blood has been shed! And how much suffering must there still be before a political solution to the crisis will be found?" Francis asked.In Jerusalem, Catholics worshipped in the church of the Holy Sepulcher, built on a hill where tradition holds that Jesus was crucified, briefly entombed and then resurrected. The cavernous, maze-like structure is home to different churches belonging to rival sects that are crammed into different nooks and even the roof.Clergy in white and gold robes led the service held around the Edicule, the small chamber at the core of the church marking the site of Jesus' tomb. Many foreign visitors were among the worshippers. "It's very special," said Arthur Stanton, a visitor from Australia. "It represents the reason why we were put on this planet, and the salvation that has come to us through Jesus. "Israel's Tourism Ministry said it expects some 150,000 visitors during holy week and the Jewish festival of Passover, which coincide this year. It is one of the busiest times of the year for the local tourism industry.Protestants held Easter ceremonies outside Jerusalem's walled Old City at the Garden Tomb, a small, enclosed green area that some identify as the site of Jesus' burial. Another service was held at the Church of the Nativity in Bethlehem, Jesus' traditional birthplace.Catholics and Protestants, who follow the new, Gregorian calendar, celebrate Easter on Sunday. Orthodox Christians, who follow the old, Julian calendar, will mark it in May.There are no precise numbers on how many Christians there are in the Middle East. Census figures showing the size of religious and ethnic groups are hard to obtain.Christian populations are thought to be shrinking or at least growing more slowly than their Muslim compatriots in much of the Middle East, largely due to emigration as they leave for better opportunities and to join families abroad. Some feel more uncomfortable amid growing Muslim majorities that they see as becoming more outwardly pious and politically Islamist over the decades.The situation for some Mideast Christians is in flux. VATICAN CITY (AP) — Pope Francis has won over many hearts and minds with his simple style and focus on serving the world's poorest, but he has devastated traditionalist Catholics who adored his predecessor, Benedict XVI, for restoring much of the traditional pomp to the papacy.Francis' decision to disregard church law and wash the feet of two girls — a Serbian Muslim and an Italian Catholic — during a Holy Thursday ritual has become something of the final straw, evidence that Francis has little or no interest in one of the key priorities of Benedict's papacy: reviving the pre-Vatican II traditions of the Catholic Church. VATICAN CITY (AP) — Pope Francis delivered a plea for peace in his first Easter Sunday message to the world, decrying the seemingly endless conflicts in the Middle East and on the Korean peninsula after celebrating Mass at an outdoor altar before more than 250,000 people in flower-bedecked St. Peter's Square.Francis shared in his flock's exuberance as they celebrated Christianity's core belief that Jesus Christ rose from the dead following crucifixion. After Mass, he stepped aboard an open-topped white popemobile for a cheerful spin through the joyous crowd, kissing babies and patting children on the head.One admirer of both the pope and of the pope's favorite soccer team, Argentina's Saints of San Lorenzo, insisted that Francis take a team jersey he was waving at the pontiff. A delighted Francis obliged, briefly holding up the shirt, and the crowd roared in approval.Francis has repeatedly put concern for the poor and suffering at the center of his messages, and he pursued his promotion of the causes of peace and social justice in the Easter speech he delivered from the central balcony of St. Peter's Basilica, the same vantage point above the square where he was introduced to the world as the first Latin American pope on March 13.The Roman Catholic leader aimed his Easter greetings at "every house and every family, especially where the suffering is greatest, in hospitals, in prisons." Francis prayed that Jesus would inspire people to "change hatred into love, vengeance into forgiveness, war into peace. "As popes before him have, he urged Israelis and Palestinians to resume peace talks and end a conflict that "has lasted all too long." And, in reflecting on the two-year-old Syrian crisis, Francis asked, "How much suffering must there still be before a political solution" can be found? The pope also expressed desire for a "spirit of reconciliation" on the Korean peninsula, where North Korea says it has entered "a state of war" with South Korea. He also decried warfare and terrorism in Africa, as well as what he called the 21st century's most extensive form of slavery: human trafficking.The first pontiff to come from the Jesuits, an order with special concern for the poor, and the first pope to name himself after St. Francis, a medieval figure who renounced wealth to preach to the down-and-out, Francis lamented that the world is "still divided by greed looking for easy gain.Earlier, wearing cream-colored vestments, Francis celebrated Mass on the esplanade in front of the basilica at an altar set up under a white canopy. He frequently bowed his head as if in silent reflection.The sun competed with clouds in the sky Sunday, but the square was a riot of floral color in Rome, where chilly winter has postponed the blossoming of many flowers. Yellow forsythia and white lilies shone, along with bursts of lavender and pink, from potted azalea, rhododendron, wisteria and other plants.Francis thanked florists from the Netherlands for donating the flowers. He also advised people to let love transform their lives, or as he put it, "let those desert places in our hearts bloom. "The Vatican had prepared a list of brief, Easter greetings in 65 languages, but Francis didn't read them. The Vatican didn't say why not, but has said that the new pope, at least for now, feels at ease using Italian, the everyday language of the Holy See. Francis also has stressed his role as a pastor to his flock, and, as Bishop of Rome, Italian would be his language.The pontiff improvised his parting words to the crowd. He repeated his Easter greeting to those "who have come from all over the world to this square at the heart of Christianity" as well as to those "linked by modern technology," a reference to TV and radio coverage as well as social media.Francis added that he was especially remembering "the weakest and the neediest" and praying that all of humanity be guided along "the paths of justice, love and peace. "In another departure from Easter tradition, Francis won't be heading for some post-holiday relaxation at the Vatican's summer palace in Castel Gandolfo, in the hills southeast of Rome. That retreat is already occupied by his predecessor, Benedict XVI, who went there in the last hours of his papacy on Feb. 28. Benedict became the first pope in 600 years to resign from the position, and eventually is to move back to the Vatican, after a convent there is readied for him.Francis so far has declined to move into Benedict's former apartment in the Apostolic Palace, into the rooms whose studio overlooks St. Peter's Square. He is still in the Vatican hotel where earlier this month he was staying along with other cardinals participating in the secret conclave to choose Benedict's successor.While Francis has just begun to make his mark on the church, it is plain he has little desire to embrace much of the pomp customarily associated with the office. VATICAN CITY (AP) — Following is the official English language translation provided by the Vatican of Pope Francis' Easter Sunday message, delivered in Italian from the central balcony of St. Peter's Basilica. What a joy it is for me to announce this message: Christ is risen! I would like it to go out to every house and every family, especially where the suffering is greatest, in hospitals, in prisons.Most of all, I would like it to enter every heart, for it is there that God wants to sow this Good News: Jesus is risen, there is hope for you, you are no longer in the power of sin, of evil! Love has triumphed, mercy has been victorious! The mercy of God always triumphs! We too, like the women who were Jesus' disciples, who went to the tomb and found it empty, may wonder what this event means (cf. Lk 24:4). What does it mean that Jesus is risen? It means that the love of God is stronger than evil and death itself; it means that the love of God can transform our lives and let those desert places in our hearts bloom. The love God can do this! This same love for which the Son of God became man and followed the way of humility and self-giving to the very end, down to hell - to the abyss of separation from God - this same merciful love has flooded with light the dead body of Jesus, has transfigured it, has made it pass into eternal life. Jesus did not return to his former life, to earthly life, but entered into the glorious life of God and he entered there with our humanity, opening us to a future of hope. This is what Easter is: it is the exodus, the passage of human beings from slavery to sin and evil to the freedom of love and goodness. Because God is life, life alone, and we are his glory: the living man (cf. Irenaeus, Adversus Haereses, 4,20,5-7).Dear brothers and sisters, Christ died and rose once for all, and for everyone, but the power of the Resurrection, this passover from slavery to evil to the freedom of goodness, must be accomplished in every age, in our concrete existence, in our everyday lives. How many deserts, even today, do human beings need to cross! Above all, the desert within, when we have no love for God or neighbour, when we fail to realize that we are guardians of all that the Creator has given us and continues to give us. God's mercy can make even the driest land become a garden, can restore life to dry bones (cf. Ez 37:1-14).So this is the invitation which I address to everyone: Let us accept the grace of Christ's Resurrection! Let us be renewed by God's mercy, let us be loved by Jesus, let us enable the power of his love to transform our lives too; and let us become agents of this mercy, channels through which God can water the earth, protect all creation and make justice and peace flourish.And so we ask the risen Jesus, who turns death into life, to change hatred into love, vengeance into forgiveness, war into peace. Yes, Christ is our peace, and through him we implore peace for all the world.Peace for the Middle East, and particularly between Israelis and Palestinians, who struggle to find the road of agreement, that they may willingly and courageously resume negotiations to end a conflict that has lasted all too long. Peace in Iraq, that every act of violence may end, and above all for dear Syria, for its people torn by conflict and for the many refugees who await help and comfort. How much blood has been shed! And how much suffering must there still be before a political solution to the crisis will be found? Peace for Africa, still the scene of violent conflicts. In Mali, may unity and stability be restored; in Nigeria, where attacks sadly continue, gravely threatening the lives of many innocent people, and where great numbers of persons, including children, are held hostage by terrorist groups. Peace in the East of the Democratic Republic of Congo, and in the Central African Republic, where many have been forced to leave their homes and continue to live in fear.Peace in Asia, above all on the Korean peninsula: may disagreements be overcome and a renewed spirit of reconciliation grow.Peace in the whole world, still divided by greed looking for easy gain, wounded by the selfishness which threatens human life and the family, selfishness that continues in human trafficking, the most extensive form of slavery in this twenty-first century; human trafficking is the most extensive form of slavery in this twenty-first century! Peace to the whole world, torn apart by violence linked to drug trafficking and by the iniquitous exploitation of natural resources! Peace to this our Earth! Made the risen Jesus bring comfort to the victims of natural disasters and make us responsible guardians of creation.Dear brothers and sisters, to all of you who are listening to me, from Rome and from all over of the world, I address the invitation of the Psalm: "Give thanks to the Lord for he is good; for his steadfast love endures for ever. Let Israel say: 'His steadfast love endures for ever'" (Ps 117:1-2). Dear Brothers and Sisters, to you who have come from all over the world to this Square at the heart of Christianity, and to you linked by modern technology, I repeat my greeting: Happy Easter! Bear in your families and in your countries the message of joy, hope and peace which every year, on this day, is powerfully renewed.May the risen Lord, the conqueror of sin and death, be a support to you all, especially to the weakest and neediest. Thank you for your presence and for the witness of your faith. A thought and a special thank-you for the beautiful flowers, which come from the Netherlands. To all of you I affectionately say again: may the risen Christ guide all of you and the whole of humanity on the paths of justice, love and peace. __Copyright Vatican Publishing House-FROM news.yahoo. SEOUL, South Korea (AP) — A top North Korean decision-making body issued a pointed warning Sunday, saying that nuclear weapons are "the nation's life" and will not be traded even for "billions of dollars." The comments came in a statement released after North Korean leader Kim Jong Un presided over the plenary meeting of the central committee of the ruling Workers' Party. The meeting, which set a "new strategic line" calling for building both a stronger economy and nuclear arsenal, comes amid a series of near-daily threats from Pyongyang in recent weeks, including a vow to launch nuclear strikes on the United States and a warning Saturday that the Korean Peninsula was in a "state of war. "Pyongyang is angry over annual U.S.-South Korean military drills and a new round of U.N. sanctions that followed its Feb. 12 nuclear test, the country's third. Analysts see a full-scale North Korean attack as unlikely and say the threats are more likely efforts to provoke softer policies toward Pyongyang from a new government in Seoul, to win diplomatic talks with Washington that could get the North more aid, and to solidify the young North Korean leader's image and military credentials at home.North Korea made reference to those outside views in the statement it released through the official Korean Central News Agency following the plenary meeting. North Korea's nuclear weapons are a "treasure" not to be traded for "billions of dollars," the statement said. They "are neither a political bargaining chip nor a thing for economic dealings to be presented to the place of dialogue or be put on the table of negotiations aimed at forcing (Pyongyang) to disarm itself," it said. North Korea's "nuclear armed forces represent the nation's life, which can never be abandoned as long as the imperialists and nuclear threats exist on earth," the statement said.North Korea has called the U.S. nuclear arsenal a threat to its existence since the 1950-53 Korean War, which ended in a truce, not a peace treaty, leaving the peninsula still technically at war. Pyongyang justifies its own nuclear pursuit in large part on that perceived U.S. threat.While analysts call North Korea's threats largely brinkmanship, there is some fear that a localized skirmish might escalate. Seoul has vowed to respond harshly should North Korea provoke its military. Naval skirmishes in disputed Yellow Sea waters off the Korean coast have led to bloody battles several times over the years. Attacks blamed on Pyongyang in 2010 killed 50 South Koreans.The plenary statement also called for strengthening the moribund economy, which Kim has put an emphasis on in his public statements since taking power after the death of his father, Kim Jong Il, in late 2011. The United Nations says two-thirds of the country's 24 million people face regular food shortages.The statement called for diversified foreign trade and investment, and a focus on agriculture, light industry and a "self-reliant nuclear power industry," including a light water reactor. There was also a call for "the development of space science and technology," including more satellite launches. North Korea put a satellite into orbit on a long-range rocket in December. The United Nations called the launch a cover for a banned test of ballistic missile technology and increased sanctions on the North.The central committee is a top decision-making body of the North's ruling Workers' Party. The committee is tasked with organizing and guiding the party's major projects, and its plenary meeting is usually convened once a year, according to Seoul's Unification Ministry. South Korean media said the last plenary session was held in 2010 and that this was the first time Kim Jong Un had presided over the meeting.The White House says the United States is taking North Korea's threats seriously, but has also noted Pyongyang's history of "bellicose rhetoric. "On Thursday, U.S. military officials revealed that two B-2 stealth bombers dropped dummy munitions on an uninhabited South Korean island as part of annual defense drills that Pyongyang sees as rehearsals for invasion. Hours later, Kim ordered his generals to put rockets on standby and threatened to strike American targets if provoked. ___Associated Press writer Hyung-jin Kim contributed to this report. Follow Foster Klug at www.twitter.com/APKlug. 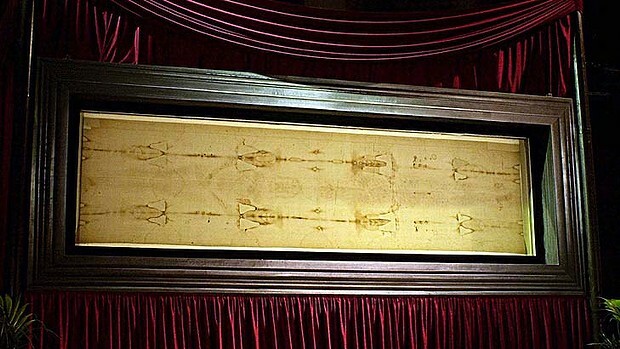 I BELIEVE THE SHROUD IS JESUS' RESURRECTED BODY.WHEN I SEEN JESUS WHEN I WAS 6 YR OLD.HIS FACE LOOKED EXACTALLY LIKE THE SHROUDS FACE.THATS WHY I BELIEVE IT IS JESUS ON THE SHROUD OF TURIN.HERE IS MY STORY ABOUT IT. Don't tell them to give more, Teach them how to give. 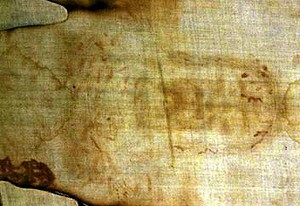 The Shroud of Turin, which since mediaeval times has been revered by many Christians as the burial cloth of Jesus, is about to make its debut on modern media platforms.On Holy Saturday the linen cloth imprinted with the faint image of what appears to be a man's body - which sceptics dismiss as a forgery - was to be shown live on the Italian state broadcaster RAI, 40 years after its first televised ''ostentation'', as exposure of the shroud is known.Pope Francis is providing a prerecorded video message for the event, which was to be broadcast from the Turin Cathedral. I join all of you gathered before the Holy Shroud, and I thank the Lord who, through modern technology, offers us this possibility.Even if it takes place in this way, we do not merely “look”, but rather we venerate by a prayerful gaze. I would go further: we are in fact looked upon upon ourselves. This face has eyes that are closed, it is the face of one who is dead, and yet mysteriously he is watching us, and in silence he speaks to us.How is this possible? How is it that the faithful, like you, pause before this icon of a man scourged and crucified? It is because the Man of the Shroud invites us to contemplate Jesus of Nazareth. This image, impressed upon the cloth, speaks to our heart and moves us to climb the hill of Calvary, to look upon the wood of the Cross, and to immerse ourselves in the eloquent silence of love.Let us therefore allow ourselves to be reached by this look, which is directed not to our eyes but to our heart. In silence, let us listen to what he has to say to us from beyond death itself. By means of the Holy Shroud, the unique and supreme Word of God comes to us: Love made man, incarnate in our history; the merciful love of God who has taken upon himself all the evil of the world to free us from its power.This disfigured face resembles all those faces of men and women marred by a life which does not respect their dignity, by war and violence which afflict the weakest… And yet, at the same time, the face in the Shroud conveys a great peace; this tortured body expresses a sovereign majesty. It is as if it let a restrained but powerful energy within it shine through, as if to say: have faith, do not lose hope; the power of the love of God, the power of the Risen One overcomes all things.So, looking upon the Man of the Shroud, I make my own the prayer which Saint Francis of Assisi prayed before the Crucifix:Most High, glorious God, enlighten the shadows of my heart, and grant me a right faith, a certain hope and perfect charity, sense and understanding, Lord, so that I may accomplish your holy and true command.Amen. ABOUT 4 DAYS AGO I HAD A DREAM LIKE I HAVE NEVER HAD BEFORE.SATAN WAS TRYING TO GET ME AGAINST JAN MARKELL.IN MY DREAM. JAN MARKELL WAS TALKING TO A PERSON BEHIND A BANK TELLER OR HOTEL RECEPTION COUNTER.THEN SUDDENLY IN MY DREAM I GOT RIGHT BEHIND HER AND STARTED LISTENING WHAT SHE WAS SAYING.THE GUY BEHIND THE COUNTER WAS SAYING YOU CAN'T GET ANY MORE MONEY.AND JAN WAS TRYING TO GET MORE OFF HIM.THIS WAS OVIOUSLY A SATANIC DREAM OF CURRUPTION TO TRY TO GET ME TO HATE JAN MARKELL.AND I REFUSED TO BELIEVE THIS LIE SATAN WAS TRYING TO PULL ON ME.JAN IS AN ISRAELI AS WELL AS DOING GREAT SHOWS.I LISTEN TO HER SHOWS EVERY SATURDAY IF THERE ON. I FIGURE JAN MARKELLS NEXT SHOW TODAY MAR 30,13 WILL REALLY BE REAVEALING SOMETHING AGAINST SATAN OR HE WOULD NOT HAVE TRYED TO GET ME AGAINST HER IN THIS DREAM.I CAN'T WAIT TO LISTEN TO THIS SHOW.I PREDICT IT WILL BE A GREAT SHOW AGAINST SATAN.I HAVE NEVER HAD A DREAM LIKE THIS AGAINST A GREAT WOMEN OR MAN OF GOD EVER.SO I KNOW HER NEXT SHOW WILL BE AMAZING. GOD BLESS YOU JAN MARKELL FOR GETTING TRUTH OUT TO THE WORLD. JERUSALEM (AP) — Hundreds of Christians streamed through the cobblestone alleyways of Jerusalem’s Old City on Friday, hoisting wooden crosses and chanting prayers to mark the crucifixion of Jesus. Throngs of pilgrims walked a traditional Good Friday procession that retraces Jesus’ steps along the Via Dolorosa, Latin for the “Way of Suffering.” They followed his 14 stations, saying a prayer at each and ending at the ancient Holy Sepulchre church.Along the route, Franciscan friars in brown robes chanted prayers in Latin and explained the different stations to crowds through a megaphone. Leonard Mary, a priest from Irondale, Alabama, was dressed as Jesus wearing a crown of thorns. He was flanked by men posing as Roman soldiers and had fake blood dripping down his chest as he lugged a giant cross down the street. “The most perfect love that was ever seen in the world was when Jesus died for us. He showed us the perfection of love,” said Mary.Good Friday events kicked off with a Mass earlier in the morning at the cavernous Holy Sepulchre, which was built on the place where tradition holds Jesus was crucified, briefly entombed and resurrected. Clergy dressed in colorful robes entered through the church’s large wooden doors as worshippers prayed in the church courtyard.Later Friday, a Mass was due in Bethlehem’s Church of the Nativity, built atop the traditional site of Jesus’ birth. Christians believe Jesus was crucified on Good Friday and resurrected on Easter Sunday.Roman Catholic and Protestant congregations that observe the new, Gregorian calendar, mark Easter week this week. 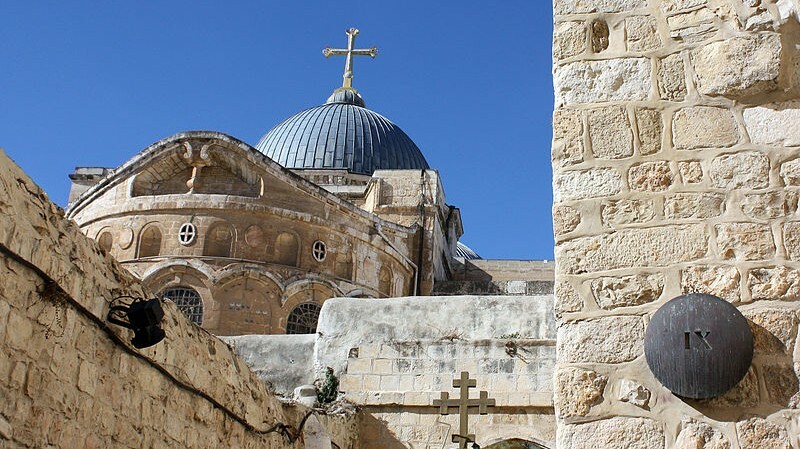 Orthodox Christians, who follow the old, Julian calendar, will mark Good Friday in May.Less than 2 percent of the population of Israel and the Palestinian territories is Christian, mostly split between Catholicism and Orthodox streams of Christianity. Christians in the West Bank wanting to attend services in Jerusalem must obtain permission from Israeli authorities. 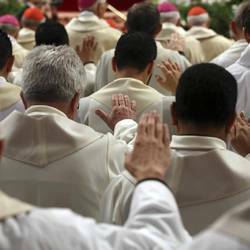 Just as changes and reforms that need to be made in the Church must be made exclusively “for the salvation of souls” – as the then Cardinal Bergoglio had said to cardinals before the Conclave – so priests should know that they are anointed “for the poor, prisoners and the sick, for those who are sorrowing and alone. The ointment is not intended just to make us fragrant, much less to be kept in a jar, for then it would become rancid … and the heart bitter.” These were the words Francis used to describe his vision of the ideal priest, in his first Chrism Mass in St. Peter’s Square.“A good priest can be recognized by the way his people are anointed. When our people are anointed with the oil of gladness, it is obvious: for example, when they leave Mass looking as if they have heard good news. Our people like to hear the Gospel preached with “unction”, they like it when the Gospel we preach touches their daily lives, when it runs down like the oil of Aaron to the edges of reality, when it brings light to moments of extreme darkness, to the “outskirts” where people of faith are most exposed to the onslaught of those who want to tear down their faith,” Francis said.“We need to “go out”, then, in order to experience our own anointing, - Francis said - its power and its redemptive efficacy: to the “outskirts” where there is suffering, bloodshed, blindness that longs for sight, and prisoners in thrall to many evil masters. It is not in soul-searching or constant introspection that we encounter the Lord: self-help courses can be useful in life, but to live by going from one course to another, from one method to another, leads us to become pelagians and to minimize the power of grace, which comes alive and flourishes to the extent that we, in faith, go out and give ourselves and the Gospel to others, giving what little ointment we have to those who have nothing, nothing at all. A priest who seldom goes out of himself, who anoints little – I won’t say “not at all” because, thank God, our people take our oil from us anyway – misses out on the best of our people, on what can stir the depths of his priestly heart.”“Those who do not go out of themselves, instead of being mediators, - Pope Francis continued - gradually become intermediaries, managers. We know the difference: the intermediary, the manager, “has already received his reward”, and since he doesn’t put his own skin and his own heart on the line, he never hears a warm, heartfelt word of thanks. This is precisely the reason why some priests grow dissatisfied, become sad priests, lose heart and become in some sense collectors of antiques or novelties – instead of being shepherds living with “the smell of the sheep”, shepherds in the midst of their flock, fishers of men.”“True enough, the so-called crisis of priestly identity threatens us all and adds to the broader cultural crisis; but if we can resist its onslaught, we will be able to put out in the name of the Lord and cast our nets. It is not a bad thing that reality itself forces us to “put out into the deep”, where what we are by grace is clearly seen as pure grace, out into the deep of the contemporary world, where the only thing that counts is “unction” – not function – and the nets which overflow with fish are those cast solely in the name of the One in whom we have put our trust: Jesus.”These words paint the picture of a shepherd who goes to look for the lost sheep in the outermost geographical and existential corners of our world. When he finds it, the first thing he tells it is that God loves and forgives it, if only it will admit that it is in need of his mercy. Pope Francis presides over the celebration of the Lord’s Passion with the Liturgy of the Word, the Veneration of the Cross and Holy Communion in St. Peter’s Basilica at 17:00 local time.Pope Francis will preside over the Stations of the Cross at the Colosseum at 21:15, at the end of which he will address faithful and give his Apostolic Benediction. After Benedict XVI’s visit to Lebanon, Patriarch Cardinal Bechara Boutros Raï was put in charge of choosing the texts for the Stations of the Cross procession at the Colosseum on Holy Friday. The texts for each of the traditional 14 Stations were prepared by a group of Lebanese young people under the Patriarch’s guidance. The Pope will bless the new fire in the atrium of teh Basilica. After the entrance procession with the Easter candle and the singing of the Exultet, John Paul II will preside at the Liturgy of the Word and the baptismal and Eucharistic liturgies, which he will concelebrate with cardinals. 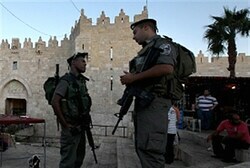 Police are on high alert in Jerusalem, Judea and Samaria as Arabs prepare to mark Land Day. Police are on high alert in Jerusalem, Judea and Samaria (Shomron) as Arabs prepare to mark Land Day. This year, it overlaps with Passover, leading to extra cause for concern.Land Day marks the anniversary of widespread Arab riots in 1976 over Israeli plans to expropriate unused land in the Galilee, some of which was Arab-owned. The day is often celebrated with violent riots.Hundreds of police officers have been stationed across the Old City and eastern Jerusalem due to concern that riots could break out after the Friday morning Muslim prayers at the Al Aqsa mosque. Police have also barred Muslim men under age 50 from the mosque for the day, following intelligence reports according to which younger men were planning a riot.Jerusalem Police are apparently not taking any risks regarding Friday prayers in wake of an incident three weeks ago in which Muslim rioters, for the first time, used firebombs against police officers on the Temple Mount.The Passover holiday means unique security considerations due both to the fact that the holiday means large, public civilian gatherings, and to the fact that Palestinian Authority terrorists have often chosen to attack on Jewish holidays.This year marked the eleventh anniversary of the Park Hotel massacre, in which terrorists targeted an Israeli Passover seder in Netanya, murdering 30 people. Temperatures to keep rising until Passover draws to a close. Friday’s weather will be pleasant, with a slight rise in temperatures making the weather unseasonably warm, weather forecasters say.Temperatures are expected to continue to rise Saturday. The warm weather will be accompanied by strong winds from the north.According to the Weather Service, temperatures will rise noticeably over the weekend, reaching heat wave weather early next week. Humidity is expected to drop. Winds will continue.The warm weather will continue until midday Monday, the last day of the week-long Passover holiday. The heat wave is expected to break early on Monday afternoon with an influx of cold, humid air which will bring temperatures down dramatically, particularly along the coast. ITS BEEN PROPHISIED BY A PASTOR PAUL BEGLEY.KING JONG UN IS NO BOY CRYING WOLF.HE REALLY WILL TAKE ACTION.GOD REVEALED TO HIM.CHRISTIANS MUST PRAY THAT HIS KIM JONG UNS WEAPONS BREAK DOWN. SEOUL (Reuters) - North Korea said on Saturday it was entering a "state of war" with South Korea, its latest bout of angry rhetoric directed at Seoul and Washington, but the South brushed off the statement as little more than tough talk.The North also threatened to shut down an industrial zone it operates jointly with the South near the heavily armed border between the two sides if Seoul continued to say the complex was being kept running for money.The two Koreas have been technically in a state of war for six decades under a truce that ended their 1950-53 conflict. Despite its threats, few people see any indication Pyongyang will risk a near-certain defeat by re-starting full-scale war. "From this time on, the North-South relations will be entering the state of war and all issues raised between the North and the South will be handled accordingly," a statement carried by the North's official KCNA news agency said.KCNA said the statement was issued jointly by the North's government, ruling party and other organizations.There was no sign of unusual activity in the North's military to suggest an imminent aggression, a South Korean defense ministry official said. 50% as blast; 35% as thermal radiation; made up of a wide range of the electromagnetic spectrum, including infrared, visible, and ultraviolet light and some soft x-ray emitted at the time of the explosion; and 15% as nuclear radiation; including 5% as initial ionizing radiation consisting chiefly of neutrons and gamma rays emitted within the first minute after detonation, and 10% as residual nuclear radiation. Residual nuclear radiation is the hazard in fallout. Considerable variation from this distribution will occur with changes in yield or location of the detonation. Because of the tremendous amounts of energy liberated per unit mass in a nuclear detonation, temperatures of several tens of million degrees centigrade develop in the immediate area of the detonation. This is in marked contrast to the few thousand degrees of a conventional explosion. At these very high temperatures the nonfissioned parts of the nuclear weapon are vaporized. The atoms do not release the energy as kinetic energy but release it in the form of large amounts of electromagnetic radiation. In an atmospheric detonation, this electromagnetic radiation, consisting chiefly of soft x-ray, is absorbed within a few meters of the point of detonation by the surrounding atmosphere, heating it to extremely high temperatures and forming a brilliantly hot sphere of air and gaseous weapon residues, the so-called fireball. Immediately upon formation, the fireball begins to grow rapidly and rise like a hot air balloon. Within a millisecond after detonation, the diameter of the fireball from a 1 megaton (Mt) air burst is 150 m. This increases to a maximum of 2200 m within 10 seconds, at which time the fireball is also rising at the rate of 100 m/sec. The initial rapid expansion of the fireball severely compresses the surrounding atmosphere, producing a powerful blast wave. As it expands toward its maximum diameter, the fireball cools, and after about a minute its temperature has decreased to such an extent that it no longer emits significant amounts of thermal radiation. The combination of the upward movement and the cooling of the fireball gives rise to the formation of the characteristic mushroom-shaped cloud. As the fireball cools, the vaporized materials in it condense to form a cloud of solid particles. Following an air burst, condensed droplets of water give it a typical white cloudlike appearance. In the case of a surface burst, this cloud will also contain large quantities of dirt and other debris which are vaporized when the fireball touches the earth's surface or are sucked up by the strong updrafts afterwards, giving the cloud a dirty brown appearance. The dirt and debris become contaminated with the radioisotopes generated by the explosion or activated by neutron radiation and fall to earth as fallout. The relative effects of blast, heat, and nuclear radiation will largely be determined by the altitude at which the weapon is detonated. Nuclear explosions are generally classified as air bursts, surface bursts, subsurface bursts, or high altitude bursts. Air Bursts. An air burst is an explosion in which a weapon is detonated in air at an altitude below 30 km but at sufficient height that the fireball does not contact the surface of the earth. After such a burst, blast may cause considerable damage and injury. The altitude of an air burst can be varied to obtain maximum blast effects, maximum thermal effects, desired radiation effects, or a balanced combination of these effects. Burns to exposed skin may be produced over many square kilometers and eye injuries over a still larger area. Initial nuclear radiation will be a significant hazard with smaller weapons, but the fallout hazard can be ignored as there is essentially no local fallout from an air burst. The fission products are generally dispersed over a large area of the globe unless there is local rainfall resulting in localized fallout. In the vicinity of ground zero, there may be a small area of neutron-induced activity which could be hazardous to troops required to pass through the area. Tactically, air bursts are the most likely to be used against ground forces. Surface Burst. A surface burst is an explosion in which a weapon is detonated on or slightly above the surface of the earth so that the fireball actually touches the land or water surface. Under these conditions, the area affected by blast, thermal radiation, and initial nuclear radiation will be less extensive than for an air burst of similar yield, except in the region of ground zero where destruction is concentrated. In contrast with air bursts, local fallout can be a hazard over a much larger downwind area than that which is affected by blast and thermal radiation. Subsurface Burst. A subsurface burst is an explosion in which the point of the detonation is beneath the surface of land or water. Cratering will generally result from an underground burst, just as for a surface burst. If the burst does not penetrate the surface, the only other hazard will be from ground or water shock. If the burst is shallow enough to penetrate the surface, blast, thermal, and initial nuclear radiation effects will be present, but will be less than for a surface burst of comparable yield. Local fallout will be very heavy if penetration occurs. High Altitude Burst. A high altitude burst is one in which the weapon is exploded at such an altitude (above 30 km) that initial soft x-rays generated by the detonation dissipate energy as heat in a much larger volume of air molecules. There the fireball is much larger and expands much more rapidly. The ionizing radiation from the high altitude burst can travel for hundreds of miles before being absorbed. Significant ionization of the upper atmosphere (ionosphere) can occur. Severe disruption in communications can occur following high altitude bursts. They also lead to generation of an intense electromagnetic pulse (EMP) which can significantly degrade performance of or destroy sophisticated electronic equipment. There are no known biological effects of EMP; however, indirect effects may result from failure of critical medical equipment. Although some nuclear weapons effects (NWE) such as blast and cratering have analogs in the effects of conventional weapons, many NWE are unique to nuclear use. In addition, blast and other �common� weapons effects are likely to be much more powerful in the nuclear case than in the realm of conventional weapons. NWE are so severe that combinations of two or more simultaneously (as in a real event) may not add linearly, complicating the design and construction of physical simulators or the writing and validation of computer simulation codes. Although thermal radiation, EMP, and ionizing radiation from a nuclear blast are all damage producing, at yields below about a megaton the blast and shock produced by a nuclear weapon are the predominant means of damaging a target. For some targets, such as underground bunkers and missile silos, blast and shock are virtually the only effective destructive mechanisms.The intensity of thermal radiation decreases only as the inverse square of the distance from a nuclear detonation, while blast, shock, and prompt ionizing radiation effects decrease more rapidly. Thus, high-yield weapons are primarily incendiary weapons, able to start fires and do other thermal damage at distances well beyond the radius at which they can topple buildings or overturn armored vehicles.Nuclear effects on electromagnetic signal propagation, which affects command, control, communications, computers, and intelligence (C 4 I), are of concern to countries expected to use nuclear weapons, particularly those which intend to explode a weapon at great altitudes or those which expect to have to defend against such a nuclear attack. C3I technology is primarily affected by high-altitude nuclear effects that could interrupt satellite-to-satellite communications, satellite-to-aircraft links, or satellite-to-ground links. Most nations will hope that signals from Global Positioning System (GPS) satellites and ground-based differential GPS transmitters will be usable shortly after a nuclear explosion, as well as traditional communications channels which must be protected. The electromagnetic pulse generated by the detonation of a single nuclear weapon at high altitudes can be a threat to military systems located as much as a thousand miles away. HEMP can disable communications systems and even power grids at enormous distances from the burst. This type of threat could be used by a third world country that has the capability to launch a rocket carrying a high-yield device (about 1 megaton or more) a few hundred kilometers into the upper atmosphere and a few thousand kilometers from its own territory (to avoid damaging its own systems). The Effects of Nuclear Weapons - This is the definitive, unclassified text on nuclear weapons effects. A team effort is underway to scan and digitize as much of the book as time permits. The Effects of Nuclear War - Office of Technology Assessment (May 1979) The Office of Technology Assessment has undertaken to describe the effects of a nuclear war on the civilian populations, economies, and societies of the United States and the Soviet Union. The effects of a nuclear war that cannot be calculated are at least as important as those for which calculations are attempted. Moreover, even these Iimited calculations are subject to very large uncertainties that make it much more difficult to predict than blast damage.